Been a while since I’ve updated. I’ll put up some of the graphic novel project I was working on a little later. 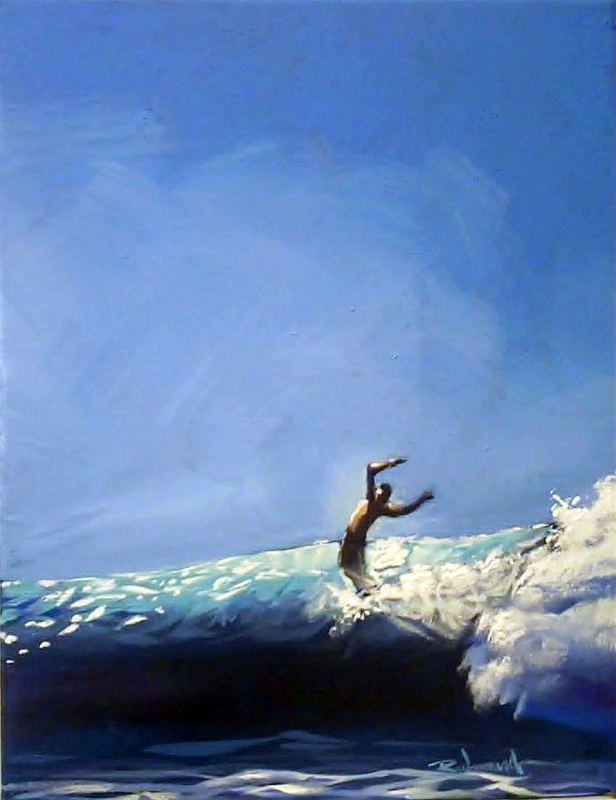 Here are some surf paintings I’ve done recently. 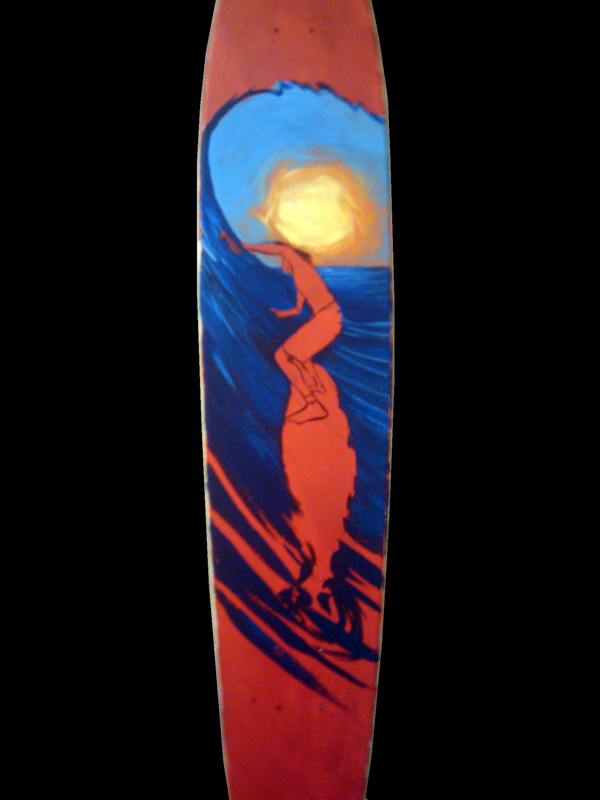 They’ll also be put up on my Surf Art site, and a few of them are for sale. 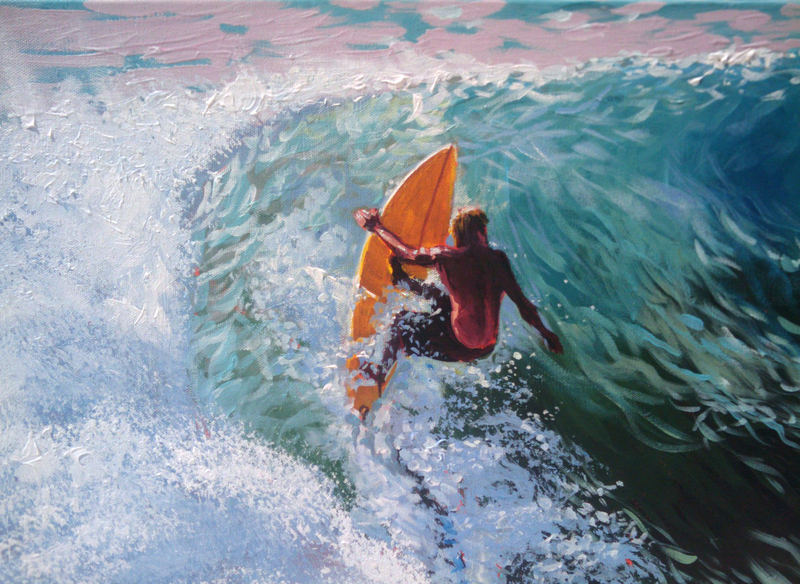 “Heart and Soul” – another one for the surf art site. A friend of mine is starting a recycled book company and he asked me to monkey around with a logo for the bookplate. I drew the whole thing in Photoshop. I’m really beginning to enjoy inking in Photoshop, now that I can rotate the canvas while I’m working. 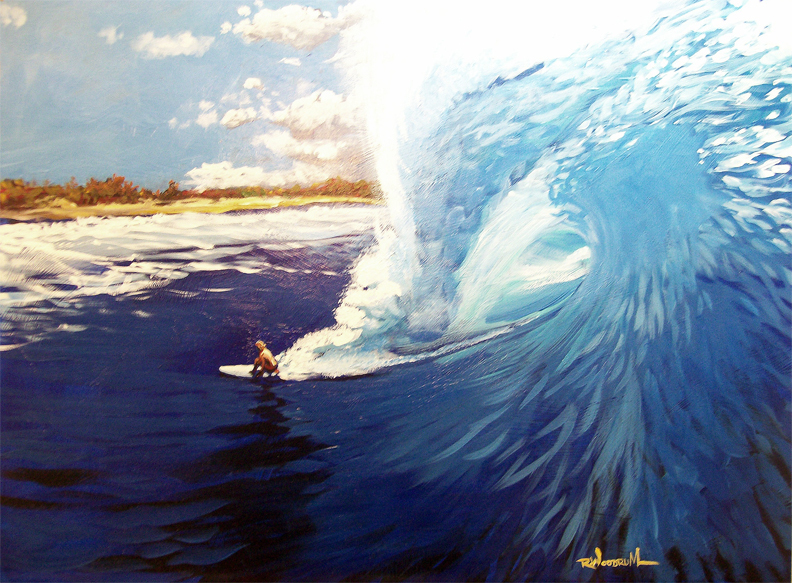 Here’s a painting I did for my daughter Janelle last Christmas. Kind of a fuzzy photo…but it’s all I was able to grab before she left with it. 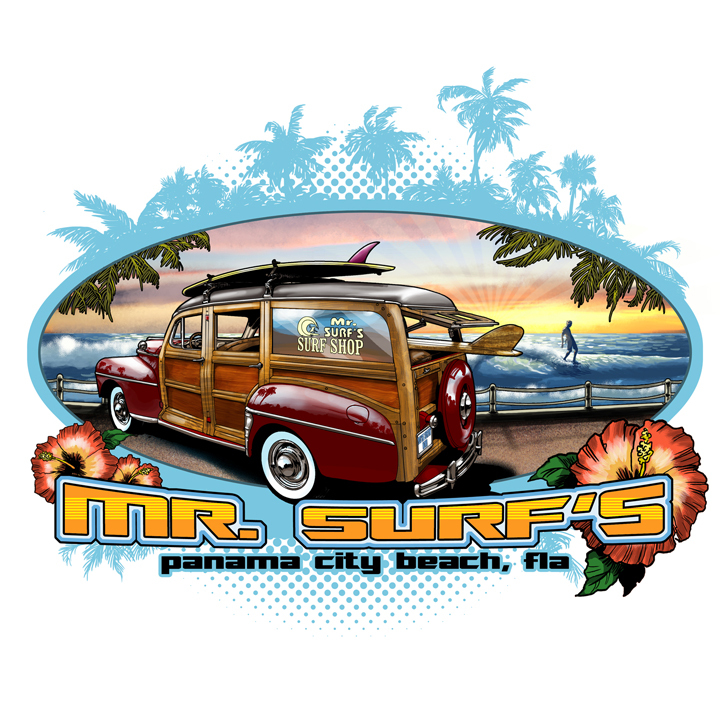 I don’t really know how I found it…but on Youtube, I saw a clip from the 1967 Batman TV show, where Batman gets into a surf contest against the Joker. Here’s a spoiler…Batman wins. He wins because he got 50 points for spraying Bat-Shark Repellent at a shark that was inserted into the scene. You go, Batman! 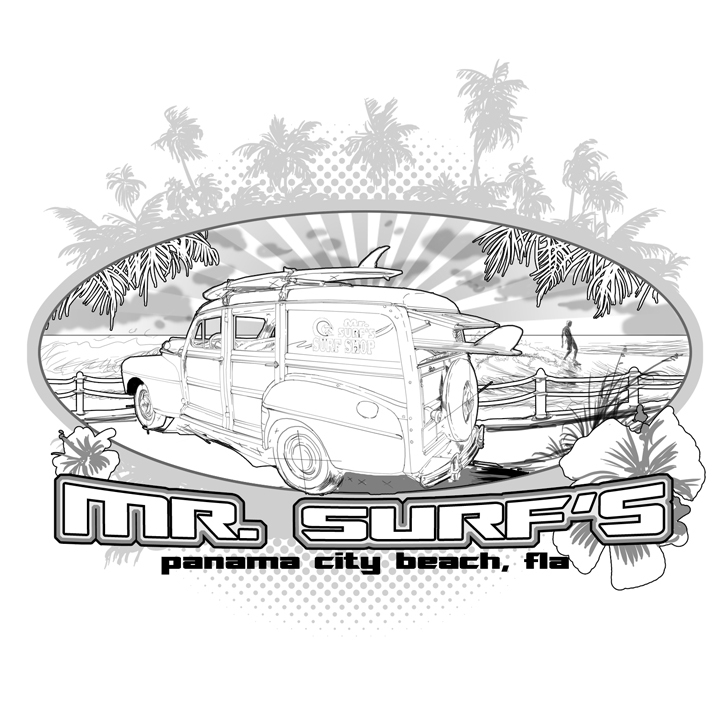 This was one of those classic surfer stereotypes of the 60’s. 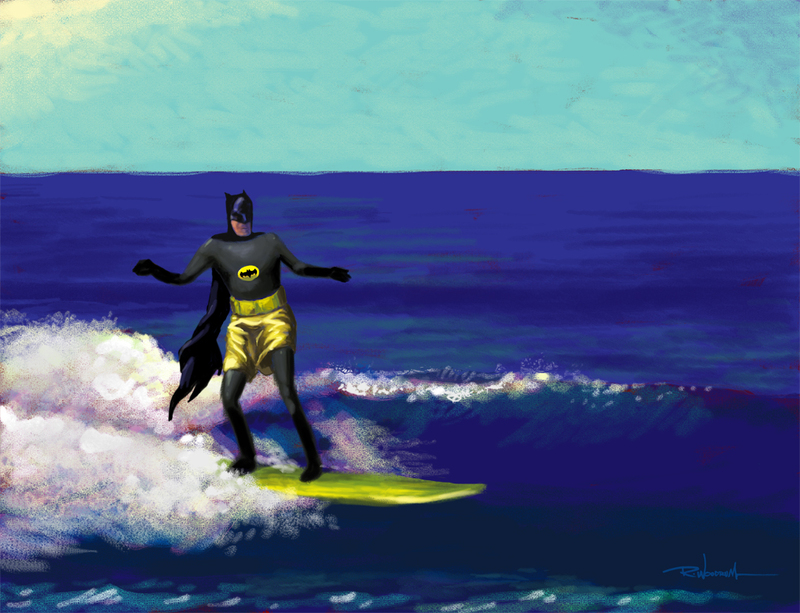 Batman and Joker paddle out into a micro-surf swell…around knee high. 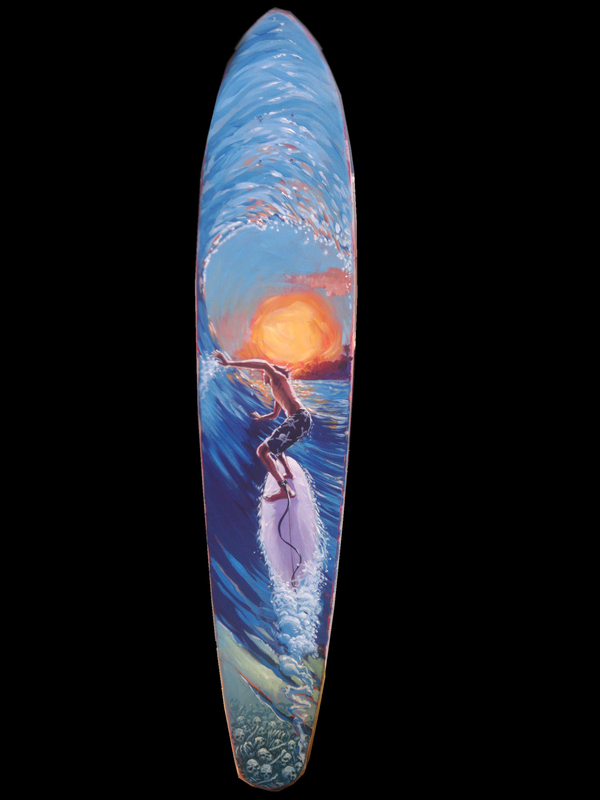 Then they both take off on the same wave, paddling on their knees (old school…and ouch)….but then we cut to the blue screen where Adam West and Cesar Romero act like they’re balancing on boards…and the wave on the screen behind them is double overhead. Like I said…it’s classic stuff. 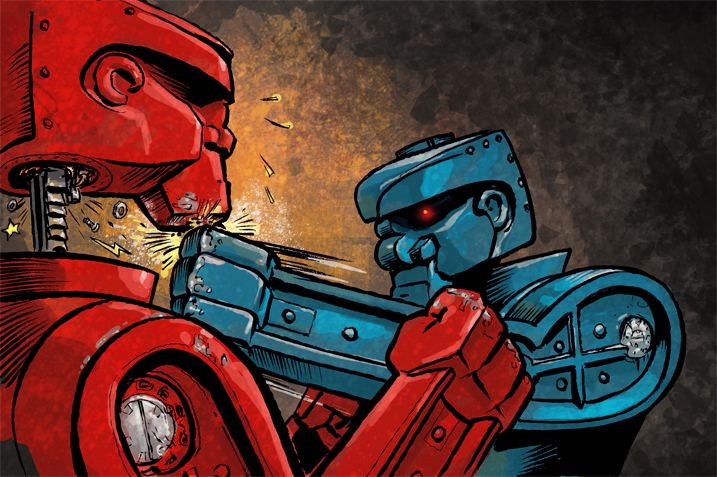 I love Rock em Sock em Robots. 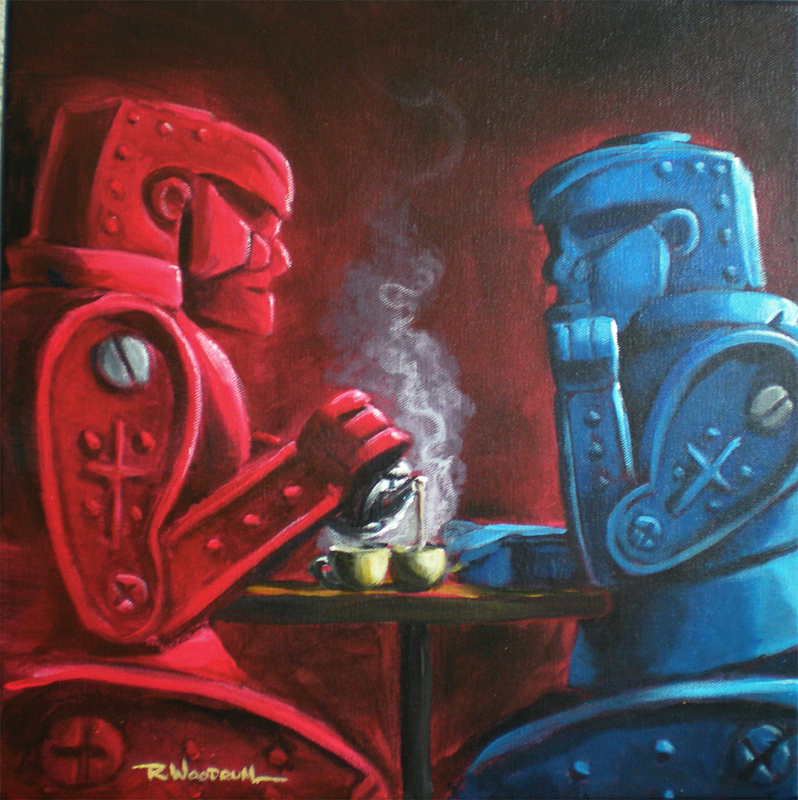 When I was about six or seven years old, those red and blue robots of the ring were the highlight of my Christmas. I enjoyed everything about them. The game-play which allowed me, at times, to actually knock my big brother’s block off; the design of the robots…so burly, so masculine…no pansy microchips in those bad boys…just the two-fisted science of gears and levers and triggers. 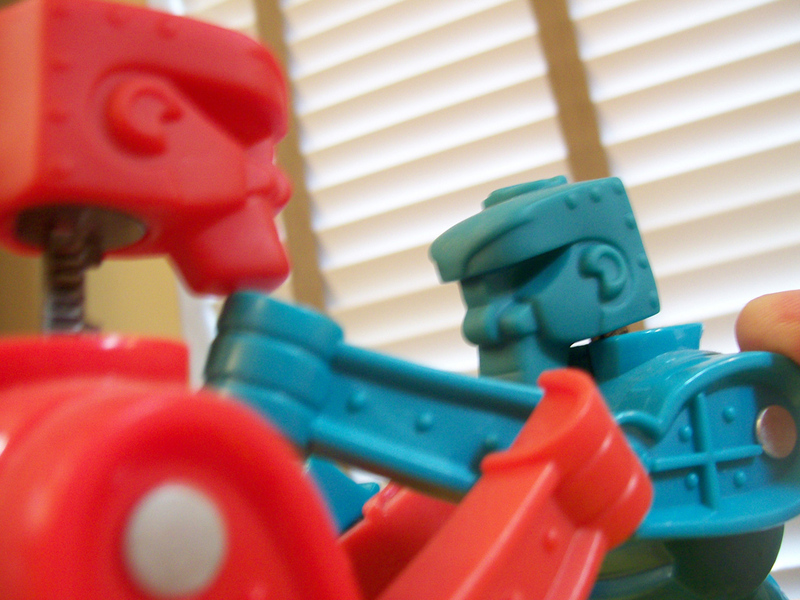 I am the proud owner of the second generation Rock em Sock em Robots which were released at Christmas time last year. They are smaller now, and the molds have less details than the originals…but they still hearken back to the manly science of my youth. I took a picture of them which I used as a model for the illustration which now adorns my banner. Kevin asked about it…so I thought I’d give more details than anyone cares about. 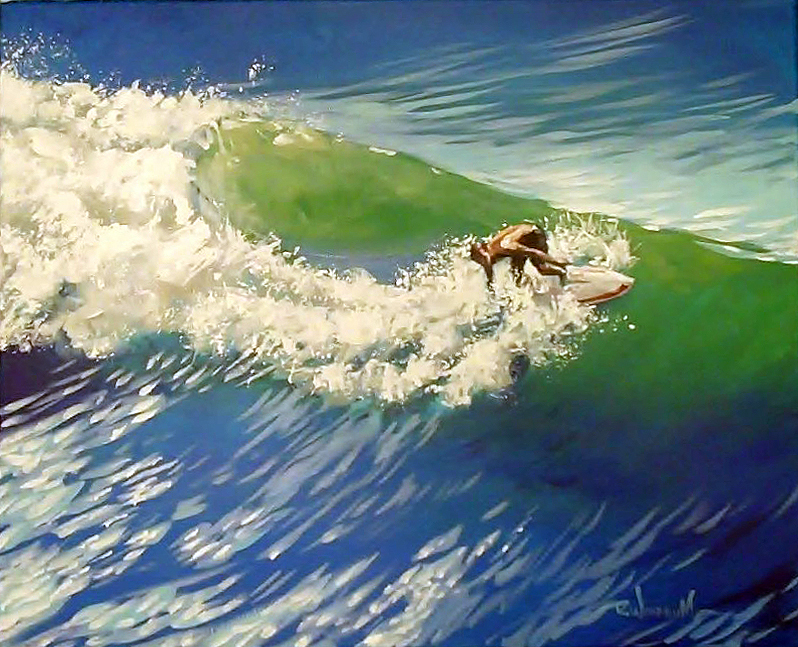 Well…I did another acrylic painting on Masonite of a wave. Here’s a not-so-great photo of it.